Kaleigh Vanderlip, of Coral, Michigan, traveled with a Post to Yantai, China, in May, as part of Montcalm Community College’s study abroad program. 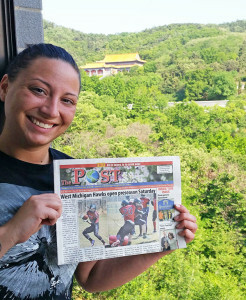 Three teachers and nine students, including Vanderlip, went to China for a week. They also spent one night in South Korea. “While in China, we learned about their culture and we even got to do group presentations with some of the Chinese students,” she explained. “We did some traveling as well, and saw some amazingly beautiful sights.” She said the picture was taken from her dorm room at the Shandong Institute of Business and Technology. Vanderlip, who graduated from New Beginnings High School in 2008, graduated from MCC this year with an Associates Degree in Liberal Studies. Thanks, Kaleigh, for taking us with you!